brochures Archives - io design & illustration, inc. 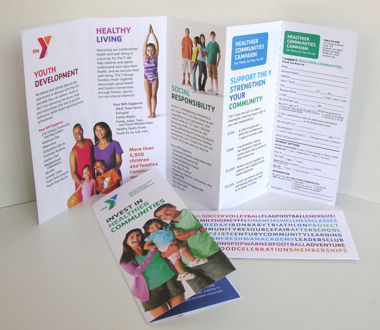 Inside spread, front and back of the five panel brochure developed for the YMCA of WNC. Part of the implementation of the new Y brand. The YMCA is in process of rebranding across the nation. They have updated their “Y” logo and created a new colorful look. Rebranding is a great time to remind your audience of who you are and what you stand for, and the Y is maximizing this truism. They are using this time to draw attention to their three areas of focus: Youth Development, Healthy Living, and Social Responsibility, reminding us of the depth of the Ys commitment to community. Starting with the 2010 Annual Report, I have worked with our Y of Western North Carolina in implementing their new brand. I worked closely with their Financial Development Director to ensure that the materials for this year’s fundraising campaign brought the new brand to life. Along with the updated graphics, we moved to a five panel brochure and included a pledge card for ease of response. Brochures sent to past donors included variable data on the pledge card, additionally adding to the ease of responding. We also revamped the newsletter, implementing brand while creating a new oversized piece to allow for more stories and larger photos. I’m proud to say that our newsletter design was presented as an example to other Ys across the country of good implementation of brand! Click here to view a pdf of the Winter/Spring 2011 issue. Other support materials included t-shirts, banners, ads and posters (shown below).